Osmosis is a two panel video installation by Cathleen Parra in collaboration with dancer and experimental theater director Lauren Hlubny. 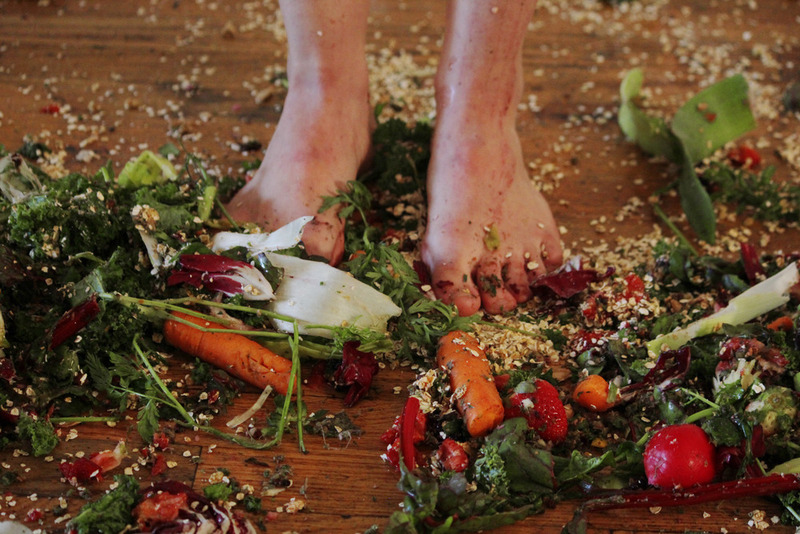 The idea for the video installation was inspired by the emotions of eating, as well as our cultures disconnected relationship with food. The two panels each display different aspects of food. The first panel being a close up of a vegetable juicer extracting the pulp of vegetables once they have created juice. The juicer sequence is symbolic of the mechanical disassociation of food production and ourselves. Food is no longer something we associate with nature, but with cans, plastic or cardboard packaging designed with a picture of the food existing in nature. The second panel is Hlubny as an anonymous creature like woman performing a narrative of food in relation to fetishism, sexualization and emotions placed on food in four different phases. The phases being worship, pulsing, smashing and mastication. As a culture we personify food as being good, bad, guilty, guilt free and so forth. Consequently this marketing trend has made way for the newly popularized 'super food'. The concept of a super food is that of a food that exists beyond nature. It is mysterious, mystical and powerful, more so than anything we have ever known. Mass media has advertised 'super foods' as the quick and easy cure. When in actuality, the super food in nature is simply, food. We've removed ourselves some far from food that the idea of unprocessed natural food itself, has become a luxury.